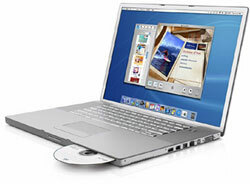 Announced in January 2003, The PowerBook G4 (17") boasted the largest screen of any portable then available. With a staggering 1440x900 17" screen, the PowerBook G4 was the most full-featured laptop Apple had ever sold. 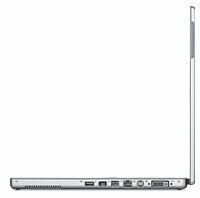 Built around a 1-inch thick aluminum case, the 17" G4 included several Apple firsts: It was the first Mac to include FireWire 800, Apple's new high-speed flavor of IEEE 1394, and one of the first Macs to include internal BlueTooth and AirPort Extreme, Apple's implementation of the 54 Mbps 802.11g wireless standard. The 17" G4 also featured PC2700 Double Data Rate RAM (a PowerBook first), and a 64 MB NVIDIA GeForce4 440 Go graphics card. It shipped in a single configuration, with 512 MB of RAM, and a 60 GB hard driive, for $3299.